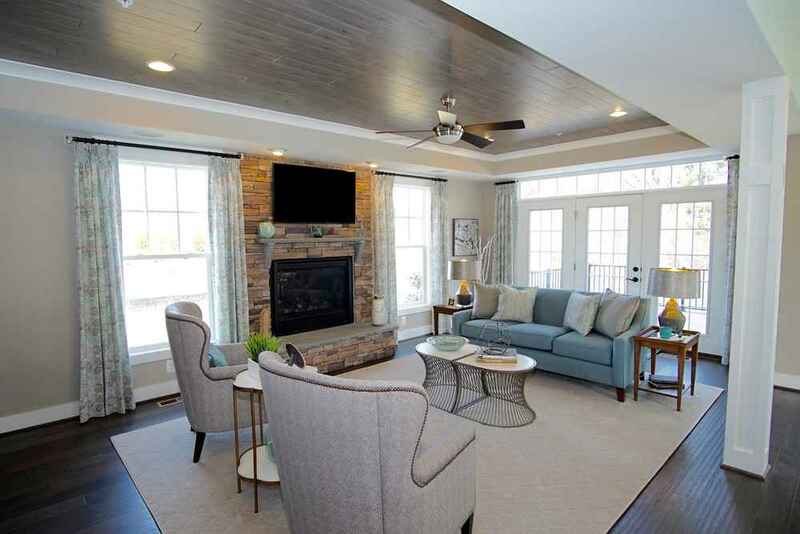 Situated on Riva Road in Annapolis, Timber Creek is a new community built by highly regarded Koch Homes. Karen Renee Interior Design was brought in to design, furnish and merchandise the model home, taking the opportunity to use several unique applications throughout. We used wood installations in the Family Room, applying an Armstrong product in the tray ceiling to pull the grey color from the fabrics onto the ceiling. The outcome was a pulled together look and ultimately created a "fifth wall". Another example of this was designed for the Breakfast Area where we created a rectangular-shaped designated space above the dining table with molding on the ceiling and installed a small patterned wallpaper inside. We also used lucite counter stools at the island to impart a trendy, modern vibe in the kitchen, which already has an airy, streamlined feel from the cool color palette of aqua, greys and whites complementing the beautiful white shaker-style kitchen cabinets. We switched things up on the second floor, punching up the Guest Room with bold hues of coral for excitement and variety, and the Owner's Suite held tones of soft blues on the custom shams and pillows - lending a sense of serenity to this safe haven of comfort. In the lower-level Rec Room, we used the same corals and blues to tie into the overall feeling of the home, but included fun game items like a pool table and Scrabble for the purpose of entertainment for all age groups.